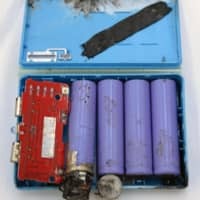 The number of reported cases of laptops, smartphones and other devices with lithium-ion batteries becoming hot or igniting in the five years until fiscal 2017 has reached to 582, a survey by the National Institute of Technology and Evaluation (NITE) showed Thursday. While the number of such incidents totaled just 70 in fiscal 2013, the figure had jumped to 175 by fiscal 2017. As nearly 70 percent of all incidents in the five years involved devices catching fire, NITE is urging users to be careful. Of the 582 cases, 150 involved portable chargers, 142 were laptops, 79 were smartphones and 32 were motor-assisted bicycles. Of 368 cases caused by problems with the devices, 209 involved products subject to recall. The institute noted that many incidents could have been prevented if the products had been adequately collected and exchanged. As lithium-ion batteries may overheat due to short-circuiting, shocks from being dropped or other forms of impact, NITE is calling on people to be cautious when they are carrying such devices. According to NITE, 50 people were harmed in the incidents in the five years. Of them, one person died and two suffered serious injuries. In November last year, a Shinkansen bullet train that left Tokyo Station and was bound for Morioka Station in Iwate Prefecture made an emergency stop after smoke was detected in one of its cars. 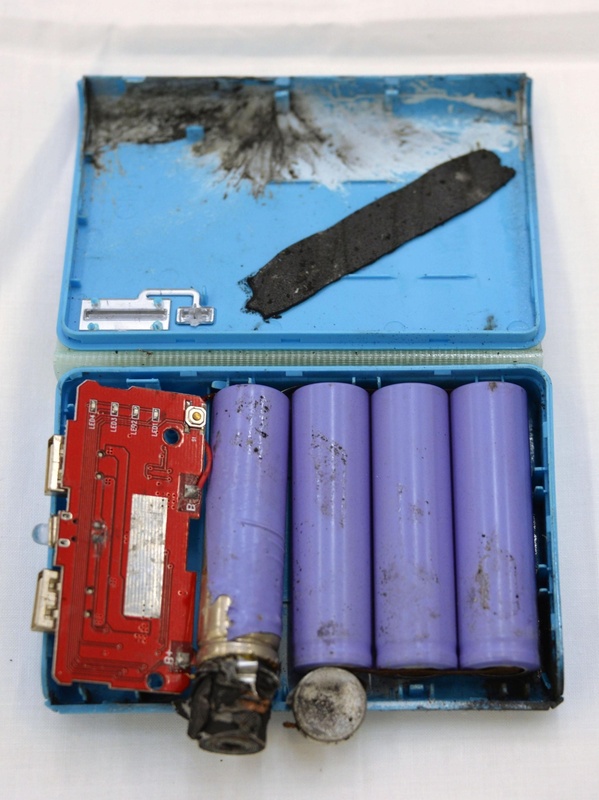 East Japan Railway Co., or JR East, the train’s operator, confirmed that the smoke came from a portable charger owned by a passenger. In response to the string of incidents, portable chargers using lithium will be subject to regulations under the Electrical Appliances and Materials Safety Act from Feb. 1. Products without a special sticker, which shows that the products passed inspections under the law, will not be made available for sale.